Bhubaneswr:18/8/18;Expressing concern over KeralaFloods, Chief Minister Shri Naveen Patnaik pressed in to assisting rescue ops an Odisha contigent of 245 fire personnel, led by the Chief Fire Officer. Trained and experienced in flood rescue, the team is carrying 75 boats & necessities like BA sets. The team has been equipped with latest modern equipment and would work under the supervision of the Kerala Government authorities. They were airlifted by an IAF flight at Biju Patnaik International Airport here. 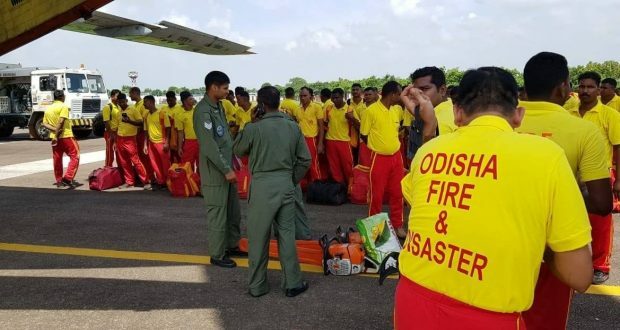 Flagging off the mission, Odisha Fire Services DG BK Sharma said the initiative was taken after a request for the same from the Centre to the Odisha Government. “On request of the Centre, the state government is sending a team of fire personnel to Kerala for rescue operations in floods,” Sharma said. 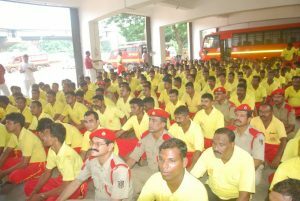 “This is certainly a matter of pride for Odisha fire services department. Earlier, Odisha fire personnel had done a tremendous job during Cyclone Hudhud in coastal Andhra Pradesh. They are equipped with modern equipment. While the team has been trained to deal with situations arising out of natural calamities like cyclone and flood, it has also been equipped with all modern equipment. We hope that our fire personnel will play a crucial role in flood operations in Kerala,” said Sharma. Chief Minister Naveen Patnaik had announced Rs 5 crore as financial assistance for Kerala flood victims. Nearly 200 people have died in Kerala flood while around 2.40 lakh people have been evacuated and they are sheltering in relief camps.